Eggs and dyes are the two central elements of Easter crafts. Decorating eggs perfectly isn't hard; just follow our tips. 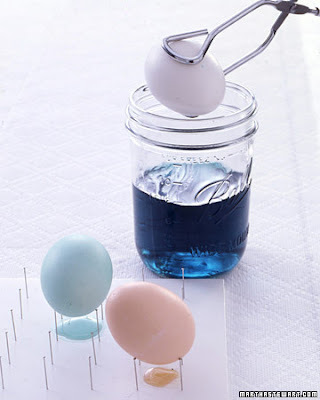 If you want to save eggs from year to year or turn them into ornaments to hang from branches, blow them out instead of hard-boiling the eggs before dyeing them. Tip: Try dyeing different types of eggs in order to vary the sizes -- use quail for smaller and goose or ostrich for larger. Also consider dyeing brown eggs to alter the range of colors you can produce. Protect your work area with paper towels or newspaper. Mix 1 teaspoon of vinegar and 20 drops of food coloring (use more to intensify color) in 1 cup of hot water in a heatproof bowl, cup, or jar deep enough to let you submerge an egg completely. 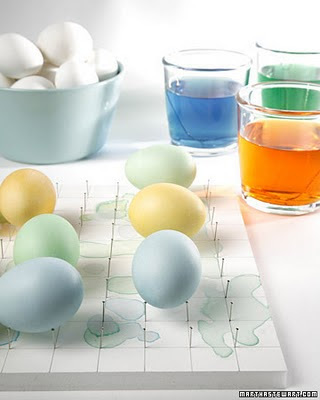 To create different tints of a color, vary dipping times: Submerge eggs for less than 5 minutes for light colors, and leave the egg in for 10 minutes or more for deeper shades. Using tongs makes handling the eggs easy. To make a two-color egg, dye the whole egg first in a light color, let dry for 15 minutes, and then submerge half into a darker color (this idea works best for hard-boiled eggs). Look at that drying tray - only Martha! From here, you can get really fancy and add masks, make multi-colour eggs, add stickers etc. I'll stick to the basics this year! Ooooh brings back memories!! This is a really good idea and I love the pastel colors. HAPPY EARLY EASTER ! !